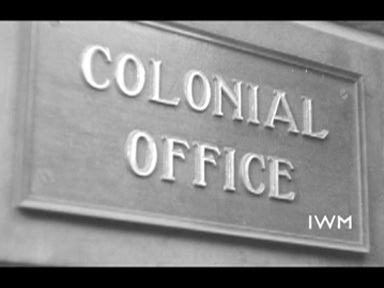 Undated film of Allenby in Palestine, and scenes of the RAF flying display at Hendon and the cerremony of Trooping the Colour, both in 1929, shot by a British medical officer serving with the Iraq Levies, 1920s-1939. (157A) October 1938: At the beginning of a new Hebrew year the first 'legal' immigrants arrive at the newly constructed port of Tel Aviv from SS Polonia. (5A) April 1935: The ship Roma arrives at Haifa. On board are new immigrants, 'legals' who have the appropriate immigration certificates, and sportsmen arriving for the Maccabiah Sports Games. (209C) February 1940: "War comes to Palestine", fitting gas masks for children in Tel Aviv. (No newsreel no; Box 719-21) Spring 1940: "Civilians alert yourselves", ARP activities in Tel Aviv, building shelters. (26A) August 1935: Slum clearance in the poor Maccabi neighbourhood. Designed to illustrate the importance of child welfare in missionary work. Children in Palestine, India, Africa, China and Japan, and some blind children are shown. Instructional film, showing daily life in Palestine two thousand years ago. Amateur footage of the record of a journey from Russia to Britain. 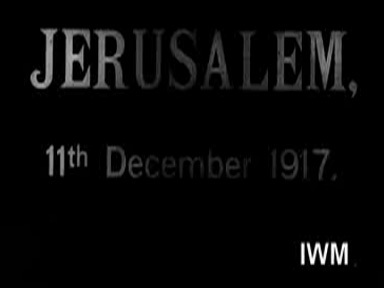 I. Newsreel item on the entry of General Allenby into Jerusalem and the reading of his proclamation, Palestine, 11 December 1917. The life of a village carpenter and his family in Palestine two thousand years a go. AMATEUR FILM. Recording plane journey across the Middle East region. Survey of the Zionist side of the problem of the occupation of Palestine. Development programmes in Kenya, Uganda and Tanganyika illustrate that "even in the midst of war, Great Britain does not shirk her responsibilities to her colonies."